If you know me, you know that I love chocolate and caramel! 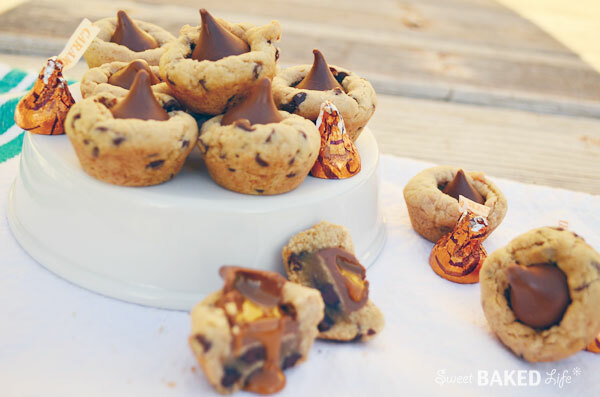 And these bite sized Chocolate Caramel Kiss Cookies are going straight to the top of my list! OK, and probably straight to my hips too! But for me that does not really matter, it’s the holidays and the time for baking, sharing and eating! These cookies are super simple to prepare as you bake them in mini muffin pans and every one will LOVE them! When I came across this yummy recipe online, they were made with pumpkin spice flavored kisses, however I could not find these locally, and since I really wanted to make them, I decided to give them my own special tweak. I ended up doubling the original recipe and in half of the batter I added Heath Bar Toffee Bits and in the other half I added Hershey’s Mini Chocolate Chips, then I topped each one with a Hershey’s Caramel Kiss. 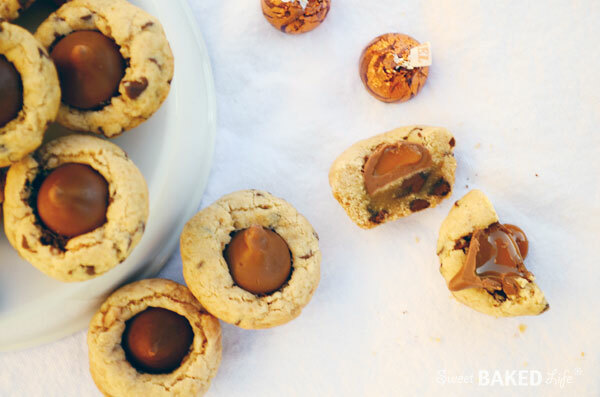 Let me tell you, when you pop one these Chocolate Caramel Kiss Cookies warm from the oven straight into your mouth, your taste buds will melt with happiness as the gooey chocolate caramel kiss explodes between the soft rich buttery base! I have one word: H E A V E N L Y ! Preheat oven to 350 degrees. Prepare mini muffin pans (I used 3 pans that each had 12 openings) with non-stick spray such as Pam. Set aside. In a large bowl, combine flour, salt, and baking soda, and gently whisk until combined. In a large bowl of an electric mixer, beat the butter and brown sugar until creamy and smooth. Add the eggs and vanilla and beat until smooth. Gradually add in the flour mixture just until combined, do not overbeat. Remove half of the dough and put into a medium bowl. In one bowl of dough add the chocolate chips and stir gently to combine. And in the other bowl of dough add the toffee bits and stir until just combined. Take one of the bowls and divide the dough into 36 one-inch balls (about 1 teaspoon each), by rolling between your hands and place into your prepared muffin pans. Bake approximately 10-12 minutes or until cookies fill the cup, are done in the middle, and golden brown on the top. Remove from the oven and immediately press one kiss into the top of each cookie, pressing down slightly. Let cool about 10 minutes, then remove the cookies from the pans and place on a rack to cool. At this point you will probably eat a few, as they are irresistible and delicious when warm! Re-spray your muffin pans with non-stick spray, and repeat the process with remaining dough. 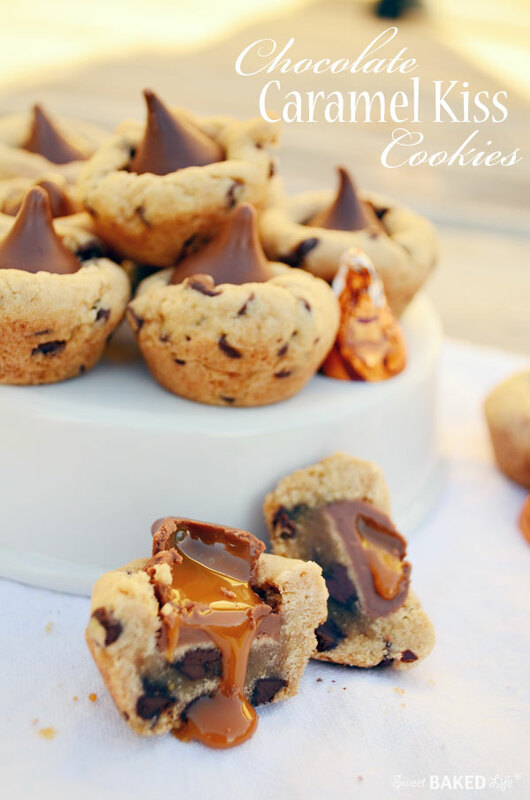 I really could not get enough of these decadent Chocolate Caramel Kiss Cookies! And like I said, they are incredible warm, but they are also fabulous eaten cooled throughout the week (well, that is if they last that long!). Even though this made a large batch of cookies, I still wished I made more as I took half of these to the office! These little gems are perfect to take to a holiday party! So simple to make! Now, I would absolutely suggest you make the recipe as indicated. However, if you don’t want so many cookies (could not imagine this! ), you can cut the recipe in half which will yield 36 cookies. Yep, they are soooo good! Cute! Super cute. My child would love these…. thanks for the recipe Sheila, and as usual awesome pics.